We noticed that Sadie was looking a little cross-eyed every now & then. Took her in for an exam yesterday to find out that she is far-sighted & came home with these glasses which she needs to be wearing all the time. We're going to have to work up to that though. She is interested in them, but wants to play with them. I know they can take a lot of the handling that she'll give them, but it's hard for me to watch knowing how much they cost. I have to admit that I had a lot of really emotional mood swings about these glasses yesterday. Felt sad that those big pretty eyes of hers that I love so much are now behind a pair of glasses & don't really look the same. 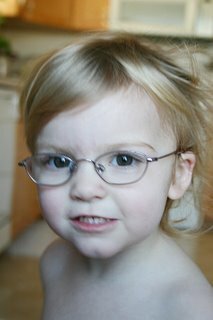 And, I just felt sad to see my little baby in glasses...which I guess made me more sad because she's NOT a little baby. I found it interesting that when talking to my dad last night he said "Well, this is just what she has to deal with in this life." & I knew that, just had to cry a little & get over it. But what my dad said made me think.....no wonder I am the way I am. No wonder I can think of things in this life on a spiritual level & understand & feel peace about it....because my mom & dad are the best at that. That's how I was raised. Just thought that was so cool. And, Dylan thinks it's cool that the little one has glasses now. He says she'll be the cute, nerdy girl. And she is still cute as can be, and still the exact same girl she was the day before, and she gave me lots of hugs & kisses this morning. How do they know when their mommas need that the most? Maybe that was a little gift from my Father in Heaven saying....it's all good. I love this little girl. She's pretty, smart and fun. Just like her mom. Oh Candace she is ADAORABLE!! 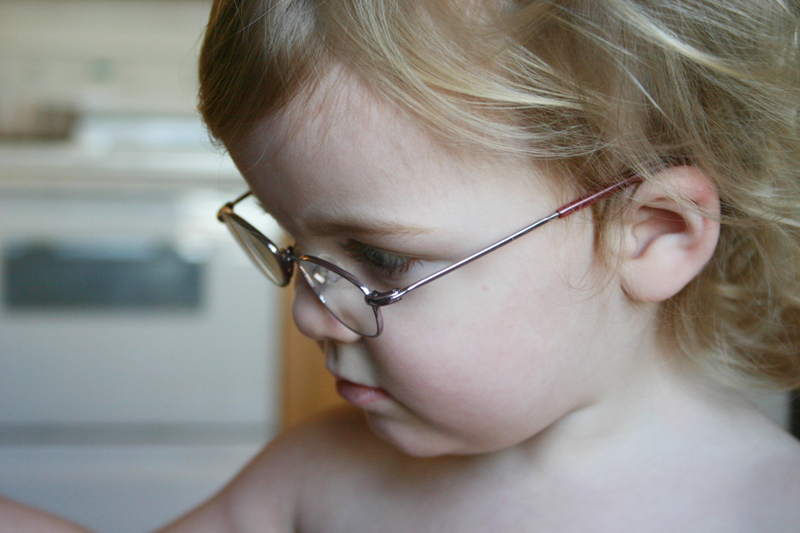 Little kids in glasses are sooooo cute, and she's the cutest I have ever seen! Seriously!!!! You are so blessed to have the parents you have, you really have been born of goodly parents, and so has SADIE! I LOVE YOU and that sweet girl of yours! Just yesterday Julia punched out the shades of her sunglasses to have "real" glasses, so see its fun stuff! I understand how you feel. As parents, we want our kids to be "perfect" or normal. Sometimes it's hard to see them have to go through things. Kind of like Kade with his lip. Kade wouldn't be Kade without that little imperfection. And we all have them. Imperfections that is....trials and hard things we have to go through. You are good momma to be so sensitive and concerned. It's only natural. Sadie is SO CUTE in those glasses it reminds me of Russell. And she never will be the "nerdy" girl she'll be the cool girl who wears glasses. Didn't you always want to wear glasses? I agree Dad and Mom are the best always! I did always want to wear glasses. And yes Heather it did remind me of Russell having to wear glasses at a young age. I think she looks so cute. And she always will be!! !